Writer Cullen Bunn maps out the Merc with a Mouth’s latest murder spree! The Avengers, the X-Men, the Fantastic Four, cosmic beings across the universe—none of them stood a chance. Three years ago, Deadpool made history when he bombed, katana’d, and blasted his way through every last hero in existence. And guess what? He’s back for more. This July, the newest super hero extinction event begins in DEADPOOL KILLS THE MARVEL UNIVERSE AGAIN #1 and #2! Writer Cullen Bunn and artist Dalibor Talajić, creators of the original best-selling series, return for an all-new five-issue run alongside the universe’s most dangerous man in red spandex. We sat down with Cullen to learn more about the return of Wade Wilson and his thirst for super-blood in the brand new series. Marvel.com: The first DEADPOOL KILLS THE MARVEL UNIVERSE ended with you, Dalibor Talajic, editor Jordan D. White, and Editor-in-Chief Axel Alonso about to be put to the sword. How did that end up going for you guys? Is Deadpool coming back again? Does the digital team have to worry this time? Cullen Bunn: Those were Earth 617.5678 versions of Dalibor, Jordan, Axel, and myself. The versions here—on our Earth—are much [cagier] and hardy! I don’t think you’ll be seeing Deadpool returning to the Marvel offices in this new series. While that worked in the original book, this new story is something altogether different. Marvel.com: In your opinion, what made DEADPOOL KILLS THE MARVEL UNIVERSE one of the most popular trades in recent years? Everyone has their own reason—but why do you think people loved it so much? Cullen Bunn: I’ve wondered that for years! Look, I am very proud of that original story. I think Dalibor and I did something special with it, but I never expected it to have the reaction—and the longevity—that it has enjoyed. It’s still one of the most popular books I’ve ever worked on. I think it’s the kind of book that attracts readers because it’s an easy jumping on point. You don’t need to know much about Deadpool or Marvel continuity to enjoy the story. The average reader off the street knows Captain America and Thor and The Hulk and Deadpool, and that’s all you really need to get a kick out of seeing Deadpool slaughter all your favorite heroes. Over the years, so many people have told me that this was both their first Deadpool book and their first comic book in general! So I guess the general accessibility is a factor with relatively new fans. Other than that, I think the fact that DEADPOOL KILLS THE MARVEL UNIVERSE is unlike any other Deadpool book ever published helps with the book’s appeal. Both of those ideas—the accessibility and the unique nature of the tale—were top-of-mind for the new series. A new reader can come off the street, having never read any other comic, and enjoy seeing Marvel’s most famous heroes get the ax. And this story is something completely different. It’s not a sequel or a remake, and it treads ground totally untouched by the original series. Marvel.com: What inspired you to bring Deadpool back for some more universe-shattering super hero murder? Cullen Bunn: Writing DEADPOOL KILLS THE MARVEL UNIVERSE was such a blast for me, so of course I wanted to return to that well at some point. I wouldn’t have pursued it, though, unless I thought we had a new kind of story to tell and some interesting and unexpected angles to explore. The tale that we’re presenting here definitely gives us something new and exciting, so it’s time to pull the trigger! Marvel.com: The Marvel Universe has changed quite a bit since the first killing spree; a bunch of new heroes in new positions all across the board. How’s the Merc going to approach these new victims differently? 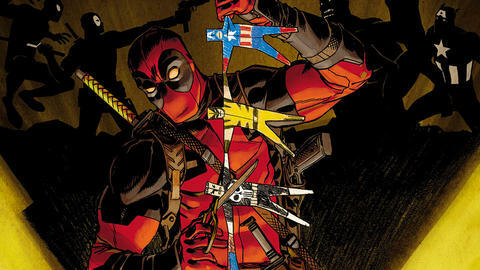 Cullen Bunn: Everything about Deadpool’s approach to murdering these heroes is different. Even though we’re revisiting a story about Deadpool killing off your favorite heroes, this is a new tale, and we went to great lengths to make sure we weren’t walking the same path. As you said, the Marvel Universe is quite different than it was when we did the original series. It has evolved and grown. Deadpool’s murderous methodologies have changed, too. That’s not to say he will have an easy time of it. There is a core group of Marvel heroes who are opposing Deadpool and trying to stop him. I think seeing these protagonists at work will be a lot of fun. Hey, maybe they’ll even stop Deadpool before he kills everyone! Marvel.com: How was it partnering with Dalibor once again to create the sequel to one of the most visually epic—and disturbing—series in recent memory? Marvel.com: The first time around, Psycho Man got everything started by pushing Wade’s mind just past the tipping point. What can you tease about how Deadpool gets his taste for hero-blood this time? Cullen Bunn: Well, I can tell you that Psycho Man is not involved in this tragic tale of woe, but absolutely keep an eye on the bad guys. Some classic Marvel villains have a hand in Deadpool’s murderous rampage. There’s a mystery to be solved and a real exciting reveal to be had further down the road. 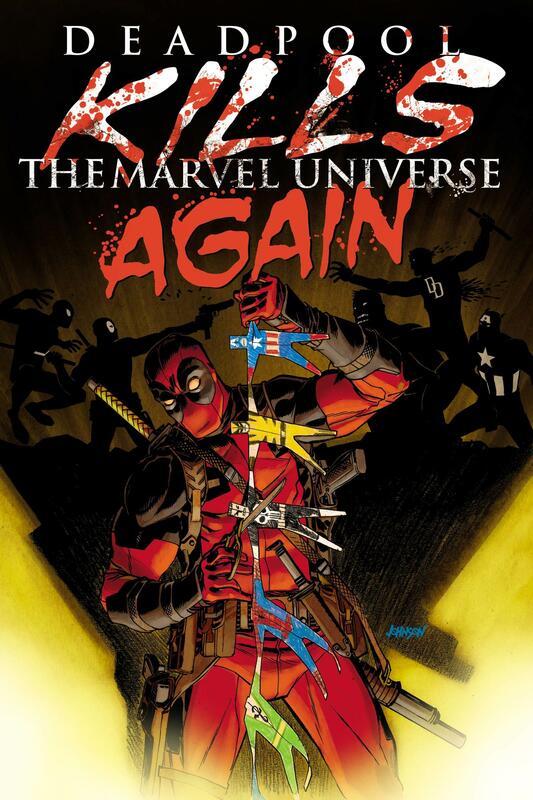 The carnage begins with DEADPOOL KILLS THE MARVEL UNIVERSE AGAIN #1 and #2, by Cullen Bunn and artist Dalibor Talajić, and available this July!